A cheerful quick and easy quilt pattern design for a summer tablerunner. 18 X 58 inches long to dress up your table. Another Quilt Pattern Design from “babs ‘n’ jas designs”. This beautiful quilt pattern design is for a cheerful tablerunner that is 18 X 58 inches long when completed. It is so easy you can make one for every member of your family and friends and of course, don’t forget one for yourself, or two or three. This Quilt Pattern Design uses pre-cut 5 1/2 X 9 1/2 inch rectangles. We love pre-cut charm packs, jellyrolls, rectangle packs, any pre-packaged, pre-cut fabric shape. Pre-cut fabric packages are great to take to quilting retreats. Pre-cut fits any quilt pattern design and the work is done for you. At a retreat, you can get right to the sewing. This quilt pattern design also uses quick and easy fusible applique for the optional circles. makes for easy stitching. The best part of this quilt pattern design is that you can use any colours you like to fit any season. Fun pinks and yellows and soft greens are great for a tablerunner for your spring table. Use bright sunny colours, sky blues and red and purples for summer. Use this quilt pattern design for your autumn table by choosing golds, burgundies, browns, and dark reds. For winter holiday time use any of the beautiful golds, silver, red, green, or try the fun pinks and purples that come out every year to make up this quilt pattern design for Christmas sharing – and gifting. 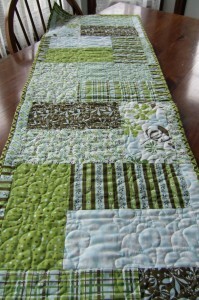 So buy a pre-cut package, or cut your own scraps and get busy on a tablerunner for your house. Sometimes I make two, and put them width-wise across the table and use them as placemats for four people. And a tip: this quilt pattern design can also double as a bed warmer to dress up the bottom of your bed, and keep your toes toasty.